Israel’s former deputy minister of foreign affairs, Danny Ayalon, explains the historical facts relating to the Israeli-Palestinian conflict. They say that the definition of insanity is doing the same thing over and over again and expecting different results. The positions of the Palestinian Arabs in the latest round of peace talks, being pushed by Obama Administration and Secretary of State John Kerry, and the concessions being expected of Israel by the U.S. and media, will most certainly lead to a failure. In the parallel universe in which Israeli-Palestinian Arab peace negotiations take place, the Palestinian Authority’s outright abrogation of prior agreements (Oslo Accords) and rejections of prior proposals (Camp David 2000 and 2008, which were pretexts for engaging in a terrorism war, the intifadah) must be placed back on the table as the starting point for the next round. This is what the Palestinian Authority (PA) complains about, and what the media expects. Is there no price to pay for intransigence and rejection? Or defeat in war? In every other situation throughout the world, when two parties are negotiating for something, there is the expectation of compromise, recognition and respect for the other side. Yet, none exists on the Palestinian-Arab side, nor do the media hold them to account. Moreover, the PA President, Mahmoud Abbas, has a limited and questionable authority: His term has expired five years ago, and he only “rules” the West Bank/Judea and Samaria. The Gaza Strip is under the thumb of Hamas: an elected terrorist Islamic resistance movement, whose genocidal intentions against Jews and Israel are evident and proudly displayed. There is no proof that even if Abbas signs an agreement, it will be honored by Hamas, or even that it will be binding on the PA.
Israel is held to impossible standards by the media. While the Israeli prime minister, Benjamin Netanyahu, has vowed to take any proposals and frameworks agreed to in negotiations directly to the Israeli people to vote and approve, what will the PA do? No one has ever said, nor pressed them to find out, if such an agreement will be endorsed by their people. While Israeli actions to defend itself are routinely cast as obstacles to peace, it is the PA’s refusal to recognize a Jewish state, in any borders, which is rarely described by the media as an obstacle, when it is the sin qua non element essential to mutual recognition and an end to the conflict. Israel’s rights, positions, opinions — those of a free democratic people — are marginalized, in favor of the seemingly poor, victimized, minority “Palestinian People.” The Palestinian Arabs are neither seen as part of the greater Arab nation (of 22 countries and 400 million), nor as people with their own country (Jordan, whose population consists of 2/3 “Palestinians,” on 78% of the Palestine Mandate, that was designated for the national Jewish homeland). Israel has merely 6.2 million Jews, plus another 1.2 million Arabs living as equal citizens, in a country of 8,000 square miles, versus the 5 million square miles of the Arab world. These Arabs have many more rights and much more freedom than they do anywhere else in the Arab world. As the indefatigable Kerry shuttles to square the circle of bringing the Israeli-Palestinian Arab negotiations to an agreement, it is instructive to focus on where the biggest obstacles to a peace deal really lie. The international media have been willing to blame Israeli “settlements” — even on land that has been under Israeli control since their capture in the defensive war of 1967, and per the Oslo Agreements of 1993; and “restrictive security practices” in PA-controlled areas (i.e. checkpoints); and even the Israeli-built security barrier, which has prevented innumerable terrorist attacks and saved countless lives on both sides, as the biggest obstacles to Middle East peace. Recently, the European Union’s envoy to Israel warned that if peace talks with the Palestinian Arabs fail, Israel was likely get blamed for it due to construction in “West Bank settlements.” What is rarely ever discussed are Israel’s strong rights to the land, both historic and legal. Israel has recently begun to redress this by its issuance of the Levy Report, which has not yet been formally adopted by the government. First and foremost, united Jerusalem, which will include both Ma’ale Adumim and Givat Ze’ev – as the capital of Israel, under Israeli sovereignty, while preserving the rights of the members of the other faiths, Christianity and Islam, to freedom of access and freedom of worship in their holy places, according to the customs of their faiths. The security border of the State of Israel will be located in the Jordan Valley, in the broadest meaning of that term. Changes which will include the addition of Gush Etzion, Efrat, Beitar and other communities, most of which are in the area east of what was the “Green Line,” prior to the Six-Day War. The establishment of blocs of settlements in Judea and Samaria [the West Bank]. Nothing has changed in the last eighteen years that would diminish Israel’s need to retain the areas referred to by Rabin. The topography of the region has, of course, not changed, and the nations around Israel have not become more peaceful or more reconciled to Israel’s existence. In fact, with the breakdown of the Arab Spring into violent civil wars on its borders (Syria, Lebanon, Egypt), and with a nuclear, terrorist-sponsoring Iran looming, the situation is even more precarious. Land for Peace, or for War? In the Arab media, the Palestinian Arabs reveal what a farce the peace negotiations are: Abbas Zaki, a member of the Fatah Central Committee, explained on Syrian television that the PA would agree to a treaty with Israel if a Palestinian state is established on the 1967 lines, which would only be the beginning of a multi-stage plan to achieve their ultimate goal: a Palestinian State on the remains of the destruction of Israel. It is also conveniently forgotten, and rarely mentioned by the media that the Palestinian Arabs have rejected a co-existent, mutually-recognized peace with a Jewish state living along side it six times: in 1937, 1948, 1956, 1967, 2000 and 2008. They have never missed an opportunity to reject obtaining their own sovereign state, if it means that they must recognize Israel. Netanyahu has repeatedly stated Israel is prepared to recognize a Palestinian state. However, the essence of the problem is the lack of reciprocity: the Palestinian Arabs’ continual and absolute rejection of recognizing Israel as the nation state of the Jewish People. Without this, there will be no genuine peace, nor any hope for an end to the conflict. Recently, Asharq Al-Awsat published an interview with the chief Palestinian negotiator, Saeb Erekat, in which he baldly claimed that Israel murdered Yasser Arafat — a lie which has been debunked repeatedly — and could do the same to Abbas. Erekat stressed that the Palestinian Arabs will not agree to have talks extended beyond the allotted nine months, set to end next month. As a result, Israel has indicated that it may not release a fourth and final group of Palestinian prisoners at the end of this month (a condition Israel agreed to in entering the current talks, last July) if Abbas does not first agree to extend the talks beyond their scheduled termination in April. This is just further verification that the Palestinian Arabs cannot bring themselves to forge an agreement with the Jewish state: Putting an end to the conflict ends the raison d’etre of the Palestinian Authority and its culture of victimhood. While Israeli society has steadily moved over the years toward accepting Palestinian-Arab self-determination, this has not been shared on the Palestinian-Arab side. The incitement rampantly permeates through Palestinian culture, in its schools, textbooks, mosques, and media and has ensured that an entire generation of Palestinians has been brainwashed and fed a diet of hatred towards Jews and Israel. The demonizing of Jews as subhuman, the de-legitimitation of a Jewish state regardless of its borders, the negation of Jewish history, and the glorification of terrorists who have murdered Jews is endemic. Adolf Hitler is quoted on the websites of Palestinian Authority schools; a young girl appears on Palestinian television describing Jews as “barbaric monkeys, wretched pigs” and the “murderers of Muhammad,” the Islamic prophet; maps on the Facebook page of the Palestinian presidential guards do not show Israel; President Mahmoud Abbas himself embraced as “heroes” released Palestinian prisoners who killed Israelis. PA officials and leaders have repeatedly stated that one of their red lines is the “right of return” which will flood Israel with potentially millions of descendants of refugees who left Israel during the 1948 War, and the concomitant refusal to allow any Jews to live in the Palestinian State. Not only is this designed to destroy the Jewish nature of Israel proper, it is pure racist in ideology and effect — And it is not a secret. This is a non-starter for Israel. In this way Abbas artfully dodges a scenario in which the Israelis would agree to a peace plan and the Palestinians would come under pressure not to derail yet another effort to resolve the conflict. Abbas’s new red lines block just about every concession that the Israelis, and even the U.S., have requested. Abbas demands: a total Israeli withdrawal from all territories that went to Israel in 1967; that Israel complete that withdrawal within three to four years; that the Palestinians not be required to recognize the Jewish state; that east Jerusalem be specified as the capital of a Palestinian state; the release of all Palestinian prisoners; and resolving the refugee issue along the lines of UN General Assembly resolution 194, which in essence means sending those Palestinians claiming to be refugees, not to a Palestinian state, but to Israel, thus terminating the existence of the Jewish state Abbas refuses to recognize. Would the U.S. Release Prisoners for Negotiations? Israel was urged by Kerry to release more than 120 Arab convicted prisoners, many of whom murderers, as a “good will gesture,” just to entice the Palestinian Arabs to come to the negotiations. No concessions, of course, were asked of the Arabs. Yet, the Obama Administration made sure to express reservations about the release of one man: Othman Amar Mustafa. It turns out he had killed an American. These prisoners were banished to the Gaza Strip as part of the Shalit deal. It turns out that in the last two years, the Shin Bet security agency has intercepted at least 80 attempted terrorist attacks in Judea and Samaria, plots that were masterminded by this particular group of released convicts. Per Shragai, the bottom line is appallingly evident: According to statistics compiled by the Defense Ministry, nearly half of the 13,000 terrorists whom Israel has released since 1985 within the framework of agreements, gestures, and diplomatic outlines resumed terrorist activities either as planners of attacks, executors of attacks, or accessories. Hundreds of Israelis have already been killed by freed terrorists and 3,000 have been maimed. The 1,150 terrorists freed as part of the Jibril exchange in 1978 went on to serve as the backbone of the leadership during the First Intifada. At least half of the 7,000 terrorists freed following the signing of the Oslo Accords were reintegrated into terrorist organizations and took an active role in the Second Intifada. As Ambassador Dore Gold has written in Israel Hayom, “now is the time to recall exactly what Israel’s rights are in its territorial dispute with the Palestinians over the future of the West Bank,” specifically the rights enshrined by the U.N. Security Council Resolution 242. Back in 1973, on the eve of the Geneva Peace Conference, the U.S. even provided a letter of assurance to Israel that it would prevent any party from tampering with Resolution 242. Israeli diplomacy sought to protect Resolution 242 as though it was a crown jewels of the Jewish state. There is no language in 242 regarding land swaps, nor any corridor crossing Israeli sovereign territory so that the “West Bank” could be connected to the Gaza Strip. Actually, per Gold, these diplomatic innovations were thought of by negotiators in the 1990s, but Israel in no way is required to agree to them, pursuant to Resolution 242. Finally, Resolution 242 says nothing about Jerusalem, that is to be a separate issue entirely. Of course, it is Israel’s position that the city is to be united and never divided again. The world saw clearly what happened when Jordan illegally occupied Judaea and Samaria, including Jerusalem, from 1948 to 1967: It destroyed more than 50 synagogues in the Old City, and denied Jews access to the Temple Mount. Under Israeli rule, the city has been unified, and all citizens and religions have free access to religious sites, and the ability to practice openly. The Biggest Problem in the Middle East? The Obama Administration, through Kerry, is trying yet again to force the parties to conclude an agreement, while the issues raised for the “solution” are not the real issues that will lead to a successful one. The U.S. continues to see only Israel’s so-called “illegal occupation” of the West Bank, the Palestinian refugee issue, and the issue of Jerusalem as the capitol of the newborn Palestinian state, as the main obstacles to conclude the peace agreement. Inconceivably, the U.S. continues to believe that by solving this intractable conflict, the remaining issues in the Middle East will be voila, solved, and harmony and tranquility will reign over the region. Despite, of course, the utter chaos in the surrounding Egypt, Lebanon and Syria. Abbas is not the man of compromise the media portrays him to be, and his people have deliberately not been prepared for peace, but instead brainwashed for hatred, violence and terrorism. He cannot deliver the goods, nor does he want to bring the Israeli-Palestinian conflict to an end. The only end that is acceptable among the Palestinian Arabs is “peace of the entire Palestine” — which means destroying Israel — and nothing less. Lee Bender is the co-author of Pressing Israel: Media Bias Exposed From A-Z , and co-President of Zionist Organization of America — Greater Philadelphia District. 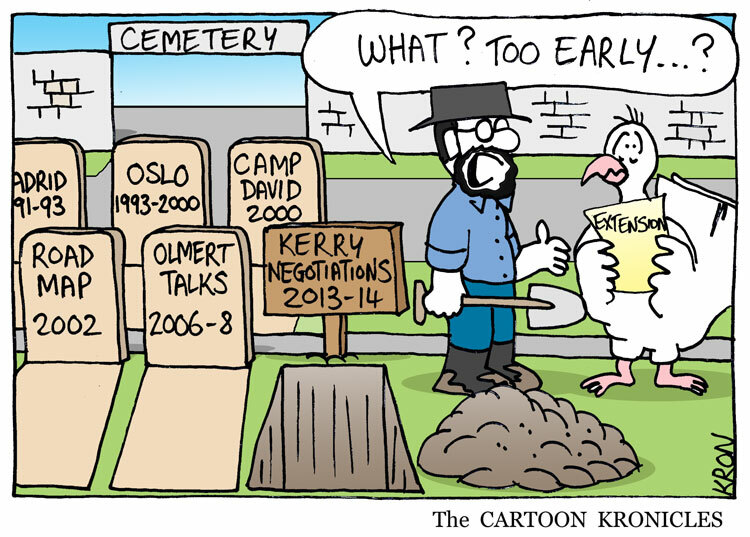 Cartoons courtesy of Yaakov “Dry Bones” Kirschen, and The Cartoon Kronicles. July 29, 2013, Press Briefing Room, Washington, D.C.
SECRETARY KERRY: Good morning, everybody. Well, as you all know, it’s taken many hours and many trips to make possible the resumption of the Israeli-Palestinian negotiations. And the negotiators are now en route to Washington, even as we speak here. And I will have more to say about the journey to this moment and what our hopes are after our initial meetings conclude tomorrow. This effort began with President Obama’s historic trip to Israel and Ramallah in March of this year. And without his commitment, without his conversations there, and without his engagement in this initiative, we would not be here today. The President charged me directly with the responsibility to explore fully the possibility of resuming talks. And in our meetings with President Abbas and Prime Minister Netanyahu, he conveyed his expectations for this process. Transcript continues follows the jump. Getting to this resumption has also taken the courageous leadership of Prime Minister Netanyahu and President Abbas. And I salute both of them for their willingness to make difficult decisions and to advocate within their own countries and with their own leadership teams – countries with the Palestinian territories. I would also like to recognize the important contributions of senior negotiators on both sides, particularly Minister Tzipi Livni and Saeb Erekat, both of whom really stood up and stood strong in the face of very tough criticism at home and whose unwavering commitment made the launch of these talks possible. I look forward to beginning work with them tonight. Going forward, it’s no secret that this is a difficult process. If it were easy, it would have happened a long time. It’s no secret, therefore, that many difficult choices lie ahead for the negotiators and for the leaders as we seek reasonable compromises on tough, complicated, emotional, and symbolic issues. I think reasonable compromises has to be a keystone of all of this effort. I know the negotiations are going to be tough, but I also know that the consequences of not trying could be worse. To help the parties navigate the path to peace and to avoid its many pitfalls, we’ll be very fortunate to have on our team on a day-to-day basis, working with the parties wherever they are negotiating a seasoned American diplomat, Ambassador Martin Indyk, who has agreed to take on this critical task at this crucial time as the UN – U.S. – excuse me – U.S. Special Envoy for Israeli-Palestinian Negotiations. Assisting Martin will be – as his deputy and as a senior advisor to me – will be Frank Lowenstein, who has been working with me on this process from the beginning. In his memoir about the peace process, Ambassador Indyk quotes a poem by Samuel Coleridge that begins, “If men could learn from history, what lessons it would teach us!” Ambassador Indyk brings to this challenge his deep appreciation for the history of the Israeli-Palestinian conflict. And from his service under President Clinton, Secretary Christopher, and Secretary Albright, he brings a deep appreciation for the art of U.S. diplomacy in the Middle East. That experience has earned Ambassador Indyk the respect of both sides, and they know that he has made the cause of peace his life mission. He knows what has worked and he knows what hasn’t worked, and he knows how important it is to get this right. Ambassador Indyk is realistic. He understands that Israeli-Palestinian peace will not come easily and it will not happen overnight. But he also understands that there is now a path forward and we must follow that path with urgency. He understands that to ensure that lives are not needlessly lost, we have to ensure that opportunities are not needlessly lost. And he shares my belief that if the leaders on both sides continue to show strong leadership and a willingness to make those tough choices and a willingness to reasonably compromise, then peace is possible. So Martin, I’m grateful that you’ve agreed to take a leave from your post at the Brookings Institution to serve once again in this most important role. And I know that you are eager to get to work, as am I. Martin. AMBASSADOR INDYK: Thank you. Mr. Secretary, thank you very much for that generous introduction and for vesting in me such important responsibilities. I am deeply honored to serve you and to serve President Obama in your noble endeavor to achieve Israeli-Palestinian peace. The fact that later today Israeli and Palestinian negotiators will sit down in this building to resume final status negotiations after a three-year hiatus is testament to your extraordinary tireless efforts, backed by President Obama, to try to resolve this intractable conflict. President Obama made the case so eloquently in his historic speech in Jerusalem in March of this year when he argued to an audience of young Israelis that, quote, “Peace is necessary, peace is just, and peace is possible.” And you, Mr. Secretary, have proven him right. You’ve shown that it can be done. I couldn’t agree more with President Obama. It’s been my conviction for 40 years that peace is possible since I experienced the agony of the 1973 Yom Kippur War as a student in Jerusalem. In those dark days, I witnessed firsthand how one of your predecessors, Henry Kissinger, brokered a ceasefire that ended the war and paved the way for peace between Israel and Egypt. Because of your confidence that it could be done, you took up the challenge when most people thought you were on a mission impossible. And backed by the President, you drove the effort with persistence, patience, and creativity. As a result, today, Prime Minister Netanyahu and President Mahmoud Abbas have made the tough decisions required to come back to the negotiating table. I’m therefore deeply grateful to you and to President Obama for entrusting me with the mission of helping you take this breakthrough and turn it into a full-fledged Israeli-Palestinian peace agreement. It is a daunting and humbling challenge, but one that I cannot desist from. I look forward with great excitement to working with you, President Abbas, and Prime Minister Netanyahu, and their teams, to do our best to achieve President Obama’s vision of two states living side-by-side in peace and security. I also look forward to working with the team that you are assembling, starting with Frank Lowenstein, who, as you said, has made such an important contribution to getting us to this point and who will be my partner in this endeavor. Fifteen years ago my son, Jacob, who was 13 at the time, designed a screensaver for my computer. It consisted of a simple question that flashed across the screen constantly: Dad, is there peace in the Middle East yet? I guess you could say, Mr. Secretary, that he was one of the original skeptics. (Laughter.) But behind that skepticism was also a yearning. And for 15 years, I’ve only been able to answer him, “Not yet.”Perhaps, Mr. Secretary, through your efforts and our support, we may yet be able to tell Jake, and more importantly, all those young Israelis and Palestinians who yearn for a different, better tomorrow, that this time, we actually made it. SECRETARY KERRY: Thank you, all. We’ll see you later. Thank you. The agreement is still in the process of being formalized, so we are absolutely not going to talk about any of the elements now. Any speculation or reports you may read in the media or elsewhere or here in the press are conjecture. They are not based on fact because the people who know the facts are not talking about them. The parties have agreed that I will be the only one making further comments about this. If everything goes as expected, Saeb Erekat and Tzipi Livni, Minister Livni, and Isaac Molho will be joining me in Washington to begin initial talks within the next week or so, and a further announcement will be made by all of us at that time. There will be plenty of leaks from anonymous sources with hidden agendas. Keep in mind what Kerry said and take them with a grain of salt. As events unfold, we will learn more. This is a positive development. That is all we know for sure.